Party time once again!! I just love seeing all of the amazing link ups each week. 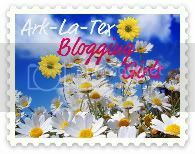 I am so blessed and thankful for all the wonderful friends that I have made through blogging. You are all so appreciated. I love the opportunity to visit with you each week, even if it is through blog land! I had the awesome pleasure of meeting one of my dear blogging friends in person a few weeks ago. She doesn't live that far from me, and personally delivered the awesome giveaway that I won from her blog. Two special treats in one. Please keep her daughter and precious new grandson in your prayers. He was born prematurely yesterday. I should be ashamed to admit that I was so excited the first person who won the prize never responded.....lucky me was next in line! YAY! Here's all the fabulous goodies that I won. 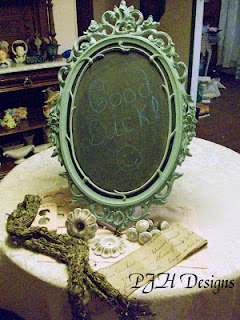 I am seriously loving that beautiful chalkboard in duck egg blue. What made it even better was meeting Peggy!!! Time for our fabulous features. 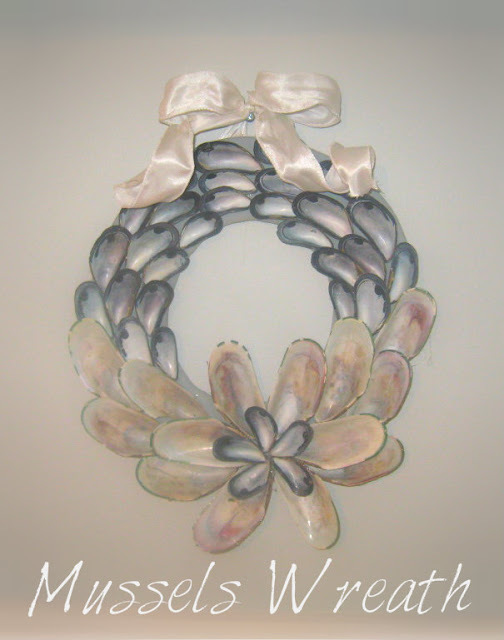 Sweet Boutique created this gorgeous wreath out of mussel shells!! Never dreamed mussel shells could look so beautiful. Pocket Full of Posies made these adorable owls from toilet paper rolls. Now that is super creative! 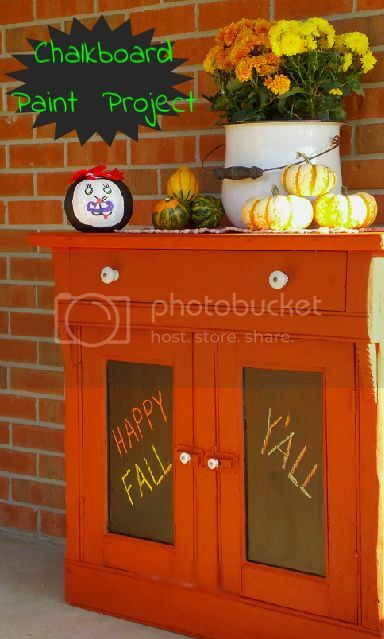 Lori Food & Farm did a fabulous makeover on her fall outdoor cabinet. I love the color and the chalkboard paint. SMC by Design created these cute and clever pumpkin name tags for wine glasses. I love the cute floral wire stems. 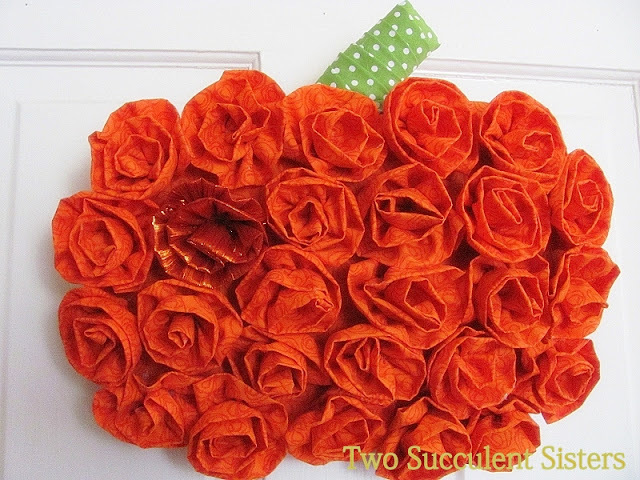 Two Succulent Sisters made this adorable pumpkin out of fabric roses! I have this cute pumpkin on my ever growing to-do list. 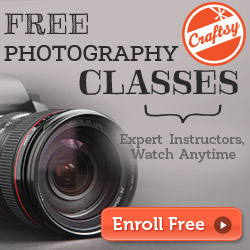 Under the Suburban Sun shared a great tutorial on glass painting! Her glasses are so pretty. 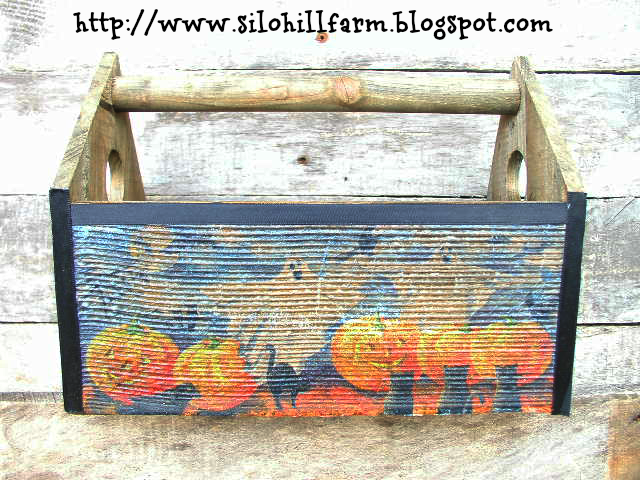 Silo Hill Farm did a fabulous job on her old tool box makeover using a napkin. So clever and cute! Jazzy Gourmet shared her delicious caramel apple chewies. These look so yummy and perfect for fall parties! 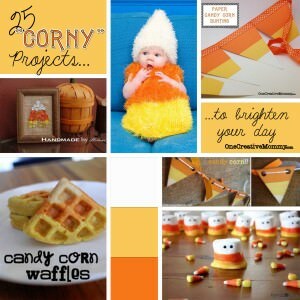 One Creative Mommy shared 25 corny projects! I love anything with the cute little candy corns. Plus she has a linky party going on for just candy corn projects. I'm trying to get my post finished to link up to that fun party. 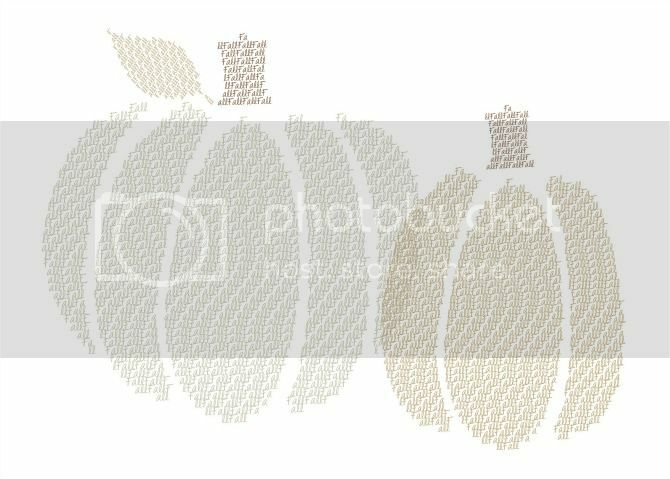 Hubby Made Me shared these cute pumpkin and leaf free printables. I can't wait to do some fun projects with these! Lucky you winning the Giveaway and meeting Peggy!! Thanks so much for hosting! Congrats on your giveaway win! Great party! Thanks for hosting. The features from last week are super cute. I am new here and a new follower so I look forward to more! Congrats on being a winner! I didn't realize Peggy's grandson was premature. He looked great in the pic she posted, and the medical field has come a long way. I'm sure he will be fine. Thanks again for hosting Kathy. Have a wonderful week! YAY! Thanks so much for the feature! You are too sweet :) Congrats on winning the giveaway and thank you for hosting another fun party! Thank you SO much for featuring my recipe. I am thrilled to pieces! Thanks for hosting and how nice to meet a blogger friend! Thank you for featuring my spooky tool box! I am honored to be included among such great projects!! 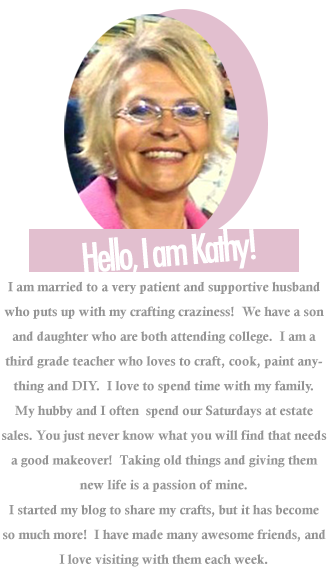 Thanks for the invite to your linky Kathy, I look forward to checking out all the cool blogs! The fabric rose pumpkin is cute! Thanks so much for hosting the party and congrats on winning that awesome prize. You are so welcome! I love it! Thanks so much for sharing. Thanks so much for sharing again this week. Always so happy to have you. Thanks so much for sharing! So happy to have you. Have a wonderful week. Thanks so much for featuring my candy corn post. I'm off to check out your candy corn project! Hey, I was featured--that is so cool! 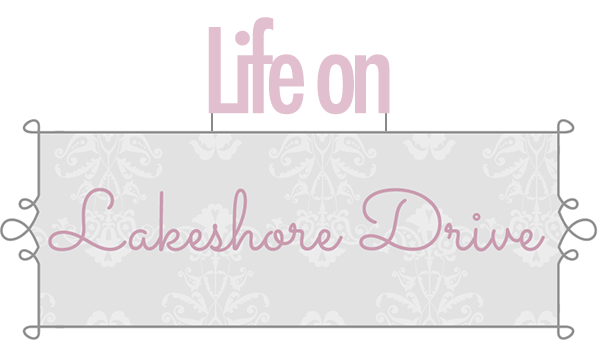 I grabbed the button and put it on my blog and felt like a star! :) Thanks for hosting! Woah...I almost missed your party! 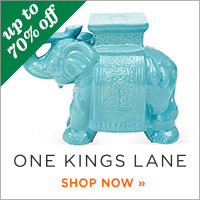 I am now following by emailso it won't happen again.Thank you for hosting!